Stormy was a horse trainer, riding instructor and competition judge until the day she realized that somewhere she had gone off course. She made a choice to leave behind the life she knew. She sold her ranch to fund her project, bought a video camera and plane tickets and set out on her odyssey to find a different way of doing things. 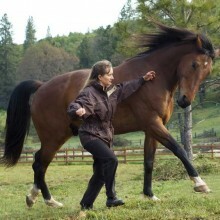 The result is the highly acclaimed ‘The Path of the Horse’ documentary DVD. Stormy’s hope was that the DVD would prompt people to re-evaluate their relationship with their horse, ask questions and share their point of view. “To produce this exceptional documentary, Stormy May ‘gave up’ her horse training career. She set off on a mission to find better and this video portrays what she learned and experienced on the journey, which will astound the viewer who is new to this kind of horse-human relationship. This beautifully produced DVD, featuring Stormy and the visionary horsemen and women she interviews (Mark Rashid, Linda Kohanov, Klaus Ferdinand Hempfling, Alexander Nevzorov and Carolyn Resnick), clearly demonstrates how horses do have a gift to share and that the future of horse-human relationships is looking much better. Footage of what is typical in today’s training and treatment of horses is shown in stark contrast to the gentle, elegant and natural ways these folks relate to their horses and do amazing things with them, also shown.